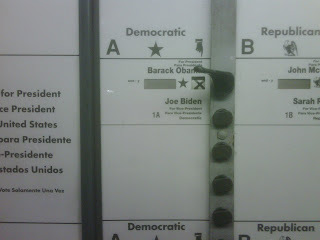 For the last time this morning, I pulled the lever on one of New York’s old-fashioned voting machines. When Election Day rolls around next year, New York State will have replaced the bulky, metal hulks, whose origins date back to the 1890s but went out of production in 1982, with optical scanning devices. Where I grow up in Independence, Mo., the state shifted in the 1970s to a punch ballot system – the same one that left the miserable hanging chads in Florida. But I still remember as a kid entering one of those time-honored booths with Dad, parting the mysterious dark curtain and watching him flip levers in columns that ran the width of the machine. The grand finale came when he registered his vote with an authoritative chug-a-chug that echoed as he heaved the red metal bar to the left. It’s a sound that makes you feel like your vote really means something, like it might be etched in stone or stamped solidly into history. I imagine that the metal-on-metal assurance that my voice was heard will be replaced by a click and a whoosh. Let’s just hope our votes will always be counted. Thank you for making a difference in our country, Stan.